. Published on Tuesday, September 25, 2018 . No matter what season, an acai bowl will always be something to crave here in Southern California. It’s loved by kids, surfers, millennials, seniors—you name it—and to no surprise. This delicious bowl of Brazilian superfuel is jam-packed with vitamins, antioxidants and natural fruity flavors like no other breakfast food or snack on the market. If you’re anything like us here at The Campus Crop, you’re constantly on the quest to find the perfect acai bowl. Keep on reading for all of our favorites! DrinkUrGreens’ mantra is “to provide an easy, accessible, affordable and effective way to be healthy.” Housed in the charming neighborhood of Glendora, they offer a wide range of healthy food and drink options. Their acai bowls, blended with the choice of apple juice, cashew milk and coconut milk, have been known for being consistently great. If you’re a chocolate or peanut butter connoisseur, their Peanut Butter/Nutella bowl will satisfy your sweet tooth with half the guilt. 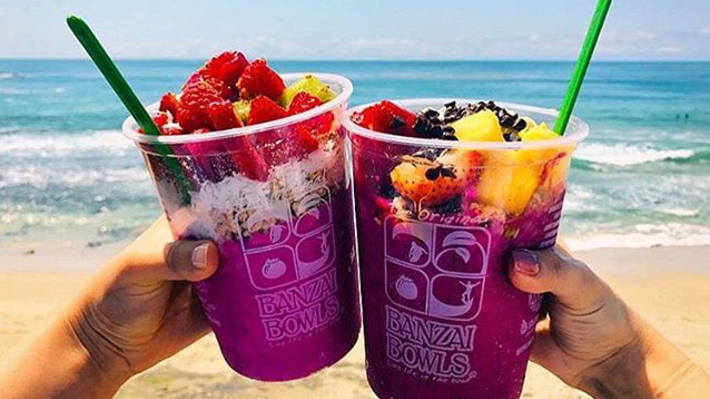 Banzai Bowls has been a tried and true sunset snack for beach-goers since the ‘90s, and for good reason. Their menu is filled with options to fit anyone’s taste. We give them an A+ for their affordable prices, unbeatable beach-side locations and highest quality ingredients which include unfiltered acai and raw, non-GMO ingredients sourced from local farms. Auraganic sets the vibe for relaxation and finding some zen while enjoying a great bowl. Here you’ll find a cozy interior with local artwork, crystals, essential oils and healing sprays. We love Auraganic for its unique combinations and toppings that you won’t find at any other juicery such as mulberries, goji berries, peanut butter and cacao nibs. Blue Bowl is easily one of the most unique and delicious acai spots in all of Orange County. In just three years, they’ve racked up over one thousand 5-star Yelp reviews. Blue Bowl is different from any other smoothie shop because of its Chipotle-like, build-your-own concept, where you’re guided through the steps of creating a masterpiece bowl. The possibilities are literally limitless because of the unlimited toppings that come with each bowl! We’re pretty stoked about the silky consistency of their acai base and the variety of delicious base options to choose from: pitaya, matcha and activated coconut. What kind of acai bowls are your favorite? Start a conversation by using the hashtag #CampusCropChat on Facebook, Twitter and Instagram. Be sure to follow us on Snapchat @asicpp!